Even now, as I set pen to paper – fingers to keyboard – I’m unsure just what I want to say about Fallout 4. I need to put what you’re currently reading into context. First off, I’m emphatically what you could call a fan of Fallout. I played the demo that preceded the original game over and over in 1997. I’ve played both Black Isle’s instalments through, the second many times. I was hugely disappointed when Van Buren was cancelled, tried and failed to get along with Fallout: Tactics, and didn’t even bother with Fallout: Brotherhood of Steel until last year. As someone who actually liked Bethesda’s The Elder Scrolls: Oblivion I was enthusiastic about Fallout 3 and played it through twice, the second run including all DLC. When New Vegas appeared I was genuinely thrilled by it, with Obsidian’s writers and designers bringing something of the moral ambiguity and factionalism of the early games to Bethesda’s shiny new engine. Its DLC went even further, offering interesting post-colonial engagements, blackly comic satire and – trust me on this one – metatextual critique of its own gameplay and design. With all that in mind you might reasonably imagine that I would have nothing but praise for Fallout 4. I had even pre-ordered it. I try to avoid pre-orders, but it was clear to me that this was a game that I was always going to rush to play. On the other hand, it’s important to bear in mind that much has changed in the years since Fallout 3 emerged – all the way back in 2008. Bethesda’s writing has still not managed to inspire me, the engine Fallout 3 ran on has dated varyingly and is prone to odd bugs, New Vegas was in many respects a superior game – so undermining Bethesda’s own efforts – and whilst Fallout 3 did offer an open world its main quest was effectively linear with only minor variations due to player choice. It’s what I’ve learned about myself and Skyrim through playing it that’s most significant here. I realised that, for me, Skyrim was a tortuously dull experience: plodding through over-familiar dungeons, fighting over-familiar enemies in over-familiar contexts by over-familiar means, collecting over-familiar loot and gaining in power all so that the same process could continue. I was over-saturated with the experience of Skyrim, and once the Emperor’s clothes had been torn away it was no longer certain that there was anything beneath them. The world of Skyrim is at once vast and densely populated, and starkly empty and flat. The player leaves no impression on it as they travel, save a short-term depopulating of loot and enemies from dungeons. Even after the antagonising superthreat is defeated at the culmination of the main story, nothing changes: dragons continue to plague the land and few if any NPCs acknowledge that anything has altered. Skyrim has been described as an interlocking set of systems situated within a world that is just large and varied enough that players can make of its constituent parts whatever they desire. For me, its world was no world at all, and its interlocking systems came to feel like a cage. And yet Skyrim was almost certainly the blueprint upon which Fallout 4 would be modelled, just as Fallout 3 was regularly described before release as “Oblivion with guns”. Surely, then, I would quickly come to detest Fallout 4 just as I had Skyrim? So that’s the bulk of the context: I have a huge amount of time for the Fallout setting and many of the games, but I have come to despise the gameplay loops and approach to worldbuilding that characterise Bethesda’s games. The ramshackle, war-torn landscapes of the Commonwealth have a comfortably videogamey aesthetic. Now for the final piece of context: I invested over 123 hours in Fallout 4. That is over five solid days of gameplay, spread over six weeks. Love and hate can be terribly intertwined in the emotional vortex that is the human psyche, but even so mine was not the behaviour of someone who didn’t like Fallout 4. Had Bethesda really produced something qualitatively superior? Or was I simply a hypocrite? Perhaps I am sufficiently attracted to superficiality that slapping some rust and ruins on top of an Elder Scrolls game was enough for me? For someone who tries to be critical about what he consumes, these were disquieting thoughts. Although my mind is far from settled on Fallout 4, I feel like there are two key points I want to explore right now. The first is that Bethesda generally have upped their game with Fallout 4. Unlike Skyrim, the player can and will leave an impression on the world. Founding, expanding and designing settlements is an important – if still mostly optional – aspect of the game, and growing defensible, resource-producing outposts across the map can be a rewarding and fun experience. Factions, too, are significant: although the main story’s branching narrative doesn’t kick in until quite late in the game, the branching is significant and does result in the annihilation of multiple factions. While representatives and footsoldiers might still subsequently be encountered, many characters will be gone and some areas sharply changed to reflect these shifts in power. Other improvements have also been made. The loot-hoovering that has come to define Bethesda’s open world games is sharply refocused as a means of collecting raw materials for both settlement expansion and weapon/armour crafting – with the latter actually providing some interesting and varied experience, unlike Skyrim’s blander “make thing better” approach. VATS has been tweaked, with a neat slowdown effect allowing a little more flexibility – and providing a little more tension – than the older timefreeze approach. The levelling system is enormous, flexible, forgiving and effectively limitless (I just reached level 60 at the end of my time with the game; the max is supposedly in excess of level 260). Rather than encouraging focused progression towards a specific character type, it allows for that same approach but also encourages experimentation and growing your character toward the style of gameplay that you want at that time. I was able to pursue a stealthy rifle-based approach for much of the game, and then devote myself towards a far less subtle power armor plus minigun approach as I fought towards the endgame. 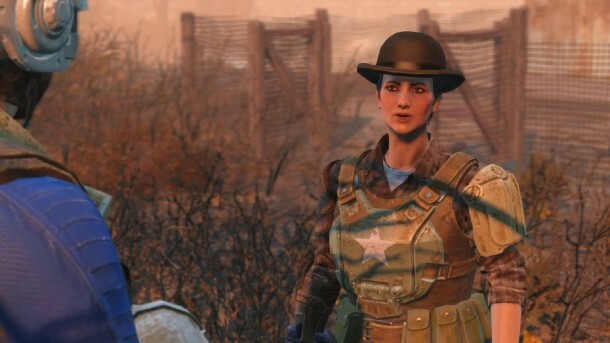 I even used companions throughout my time with Fallout 4, and may actually remember a few of them as characters. Who did Fallout 3 have? Um… Fawkes? Mirror mirror on the wall, who’s the most French robot of them all? I have to couch all of the above with corresponding criticisms. 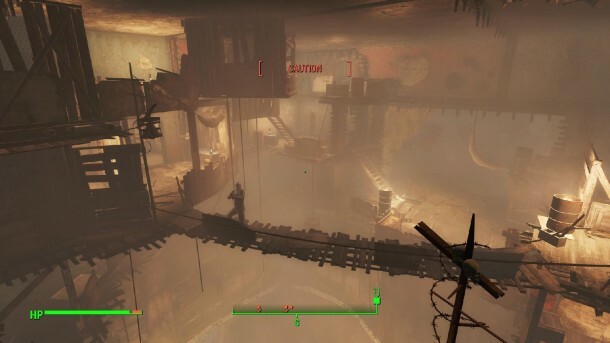 Most of the wastelanders who live in your settlements are entirely interchangeable non-entities, and the focus on settlements is entirely on its Minecraft-inspired construction elements and resource stockpiles rather than people. This is an understandable yet disappointing approach. As for the factions, because Fallout 4 has moved even further than its predecessors towards violence as the resolution of all conflict, it’s inevitable that a lot of characters who you might like will have to be slaughtered because the game dictates that this is so. There is no opportunity for dialogue once you are far enough down a factional path, even with someone you may have travelled with for hours. Is it so much to ask that a strong relationship might allow for mutual respect, a lowering of arms, and an agreement to go separate ways? Or that a charismatic smooth-talker might even manage to seduce someone away from their faction entirely? In the series’ more role playing-oriented past, perhaps, but not here. Loot-hoovering, despite the new utility of the items you can find, is even more time-consuming – particularly so when you’re short of particular resources like screws, aluminium or adhesive. As I neared the end of the game I decided to stop rummaging through containers and corpses and this felt genuinely liberating… but had I opted for such liberation earlier in my playthrough I would have been largely locked out of the game’s settlement-building and item-crafting elements. 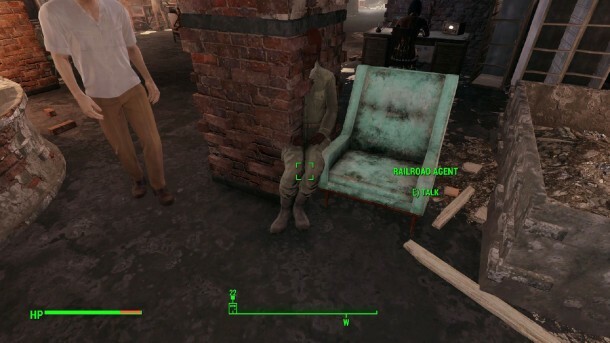 The general improvements to VATS have rendered some elements disappointing. I genuinely loved firing miniguns in VATS in Fallout 3 and New Vegas thanks to the John Woo-esque tight camera pans around my character as lead poured forth and shell casings rained down. 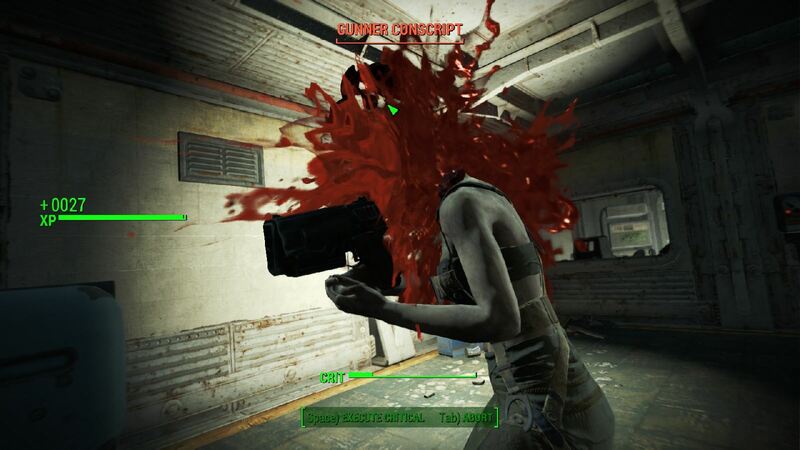 In Fallout 4 those specific moments are gone in favour of tight bursts of fire with no pomp or bombast; other weapons are, to be fair, less severely impacted. Finally, because the levelling system is so flexible it is also amorphous and sprawling; it is perhaps the ultimate Bethesda levelling system because it is exactly what you make of it, and if you don’t think about it enough you’ll probably just make an unfocused mess. 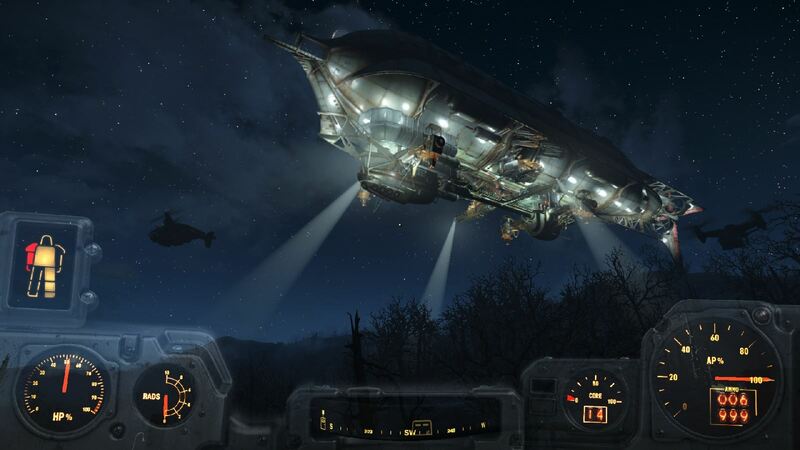 Still, overall I regard Fallout 4 as a largely successful set of moves in a better direction. When this thing appeared I sat and watched it slowly fly by for a full minute. Five paragraphs ago (sorry) I mentioned a second point: this one hinges on those “Oblivion with guns” accusations, and my own disquiet at the idea that I was a hypocrite for liking Fallout 4 and disdaining Skyrim. As established, I think there are quite a few distinctions to be made between these two games – but it’s undeniable that these are all alterations that sit atop the same core gameplay loops. So why is it that I feel so differently? A conversation with my girlfriend may have led to the simple revelation that it is actually down to how these worlds are presented – but there may be more to it than my earlier description suggests. Skyrim’s setting is that of a very generic fantasy. This was one of my most substantive criticisms last year; it has eschewed the weirder, more unique brushstrokes occasionally visible in its predecessors for an instantly recognisable milieu of TV-deep Norse culture and fourth-hand Tolkeinesque tropes. Skyrim’s setting is accessible, its inhabitants recognisable and readable in terms of the conventions of fantasy genres – conventions that have been repeatedly drummed into the collective psyche of gamers through years of games. In some contexts I might call it a restrained fantasy in the same way as, say, Game of Thrones, in that its more overtly fantastical elements are downplayed in favour of a focus on human drama and politics. Someone should’ve told Bethesda that this approach benefits from an understanding of human drama and politics, but hey-ho. All this stands in stark contrast to Fallout’s setting. Where The Elder Scrolls is minimalist with regards the excesses of fantasy, Fallout takes a maximalist approach. Its setting is a rich smorgasbord of 1950s aesthetics and Golden Age Americanism, cynical satire on the same, robots and lasers and mutants, Cold War conflict between superpowers and ideologies, the dark dreams of those who lived in fear of the bomb, critiques and celebration of contemporary social trends or threats… it is a radiation-saturated celebration of science-fantasy excess. As a world, that of Fallout thumbs its nose at the po-faced dourness of Skyrim and its humourless brethren. The coherence of post-nuclear America is forever straining under the weight of its own internal contradictions, but it holds together because this canvas is capable of telling so many different stories. With that in mind it seems understandable that I’d derive more interest and pleasure from Fallout 4′s dioramas and small stories. Reading one of Skyrim’s many books rarely interested me, filled as they were with bland moral fables and blander fictive histories that meant little to the gameplay world. But reading log entries on terminals scattered around Fallout 4‘s many locations was an experience that often resonated more: here were many brief glimpses of human stories that reflected the corruption of pre-war America, the rotting core of the 1950s American Dream, the tragedy and misery of all those who died or survived the fall of the bombs. Sure, my imagination probably did a lot of the work here – but that Bethesda’s latest Fallout effort fired my imagination in the first place is an achievement Skyrim fell short of. Would I recommend Fallout 4? I don’t know, dear reader: this isn’t a review. This is me grappling with my own opinions, my critical instincts, some gameplay systems I feel ambivalent about and two different fictitious worlds that evoke very different responses from me. Really, I wrote this for myself – but if you made it this far I hope you got something from it too.